As a young professional, you know what it means to cherish your days off. You all know the feeling of anticipation as you count down to those free days, and when they finally arrive, the sense of gratitude and relief that enables a sense of purpose and pleasure. Nasir Sobhani, a Canadian barber now living in Melbourne, can relate. But for very different reasons. “I love cutting hair…I love it so much, it’s like my new way of getting high, man. You know? It’s my new drug…That’s why I do it six days a week and then on my 7th day, I’m like, man, I might as well do it on the streets,” says Sobhani as he trims the facial hair of a homeless man on a public bench. In his early 20s, Nasir was battling a cocaine addiction. Thanks to a successful rehab program and the support of his family, he powered through, eventually kicked the addiction and moved to Australia for a fresh start. Finally able to clearly envision a future doing what he loved, he began working as an apprentice in a Melbourne barbershop, and while working there struck up a conversation with a heroin addict washing windows outside. The man had been free of heroin for a month and to celebrate, wanted a haircut. 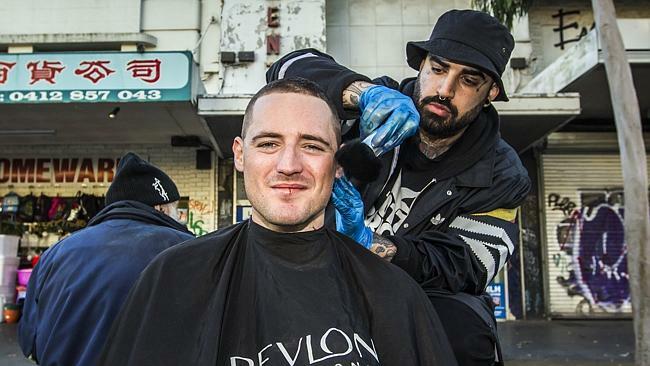 So about a year ago, Sobhani, as The Streets Barber, began spending his off-days going around the suburb of Footscray offering free haircuts and shaves to the homeless. He has been documenting the initiative on his Instagram account and was just recently featured in a PLGRM documentary that you probably shouldn’t watch if you’re nowhere near a box of tissues. As if this week we needed another reason to love our country…it’s people like this that make us proud to say the word, Canadian.